Scandinavians are a hearty bunch — they had to be to survive those sometimes harsh and brutal winters. While modern Scandinavians may not fight so hard anymore, their ancestors had to make the most of every animal hunted; meaning nothing was wasted. Hooves were boiled down into gelatin, hearts were fried into nuggets and blood was baked into pancakes. Blood acts as an egg substitute and kicks in extra protein and binds the milk and flour together. Without eggs, these pancakes are dense, savory and dark — and loaded with iron. To counteract a metallic taste, cooks throw in spices or sweeteners like molasses. In Finland, where blood pancakes are believed to have originated, they are known as veriohukainen. In Sweden, they are known as blodplattar. Most modern recipes call for pig or cow blood, though the blood of any animal will do. Remaining popular in Finland, the Finnish can skip the entire preparation process and buy ready-made frozen blood pancakes. Baby mice wine is a traditional Chinese and Korean health tonic. As little as three-day old mice, whose eyes are still closed are stuffed alive into a bottle of rice wine (bei jiu). After fermenting for 12 to 14 months, hopefully they are finally safe to drink. Some words of caution: If not properly collected, the mice can end up contaminating your drink. If you’re still interested in giving this a try, be warned the wine is said to taste like gasoline. Stinkheads are a favorite in Alaska and are fermented salmon heads that really and truly do stink. The heads are placed in a cloth sack and buried in barrel underground for about a week to ferment. When dug up, they are slightly mashed with a fork and consumed as is. Stinkheads were responsible for a spike in E. coli outbreaks in Alaska in the mid-1980s. These grubs are named after the bush they feed on (the witchetty bush) and are a staple in the diets of Aboriginal Australians. They are said to taste like almonds or any lightly cooked nuts and are high in protein. The grubs live about 2 feet under the ground. When handled they release a brown liquid as their defense mechanism. After they are dug up, the witchetty grubs can be eaten raw or cooked in hot ashes so their skin goes crispy. Their cooked center goes yellow like a hard boiled egg. 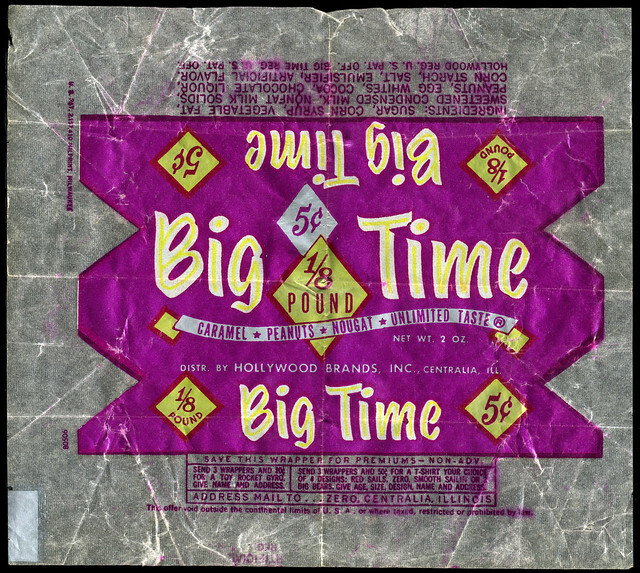 Another candy bar produced by the Hollywood Brands company was the Big Time bar. It was a bar with peanuts in a nougat center topped with caramel and chocolate. The Hollywood Brands company was notable because they discovered a method of making fluffy nougat for candy bars that Frank Mars copied for his Milky Way bars. (Frank Mars founded the Mars, Incorporated company which makes Mars, Twix and M&M’s among others.) In the beginning as well, by using real and quality ingredients, company founder Frank Martoccio was able to sell his candy bars for 3 cents, undercutting Hershey’s 5 cent bars at the time. (This was back in the 1930s until 1955.) He sold the company in 1967 and the quality standards were not continued. Today, Hershey’s retains all the brands owned by Hollywood. The only bars that still exist today from Hollywood’s line are Zero and Milky Way. 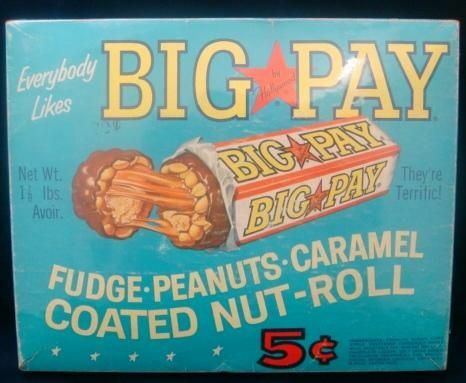 The Big Pay candy bar was a circular fudge coated, peanut rolled with a caramel center chocolate bar that cost a whopping nickel to buy! 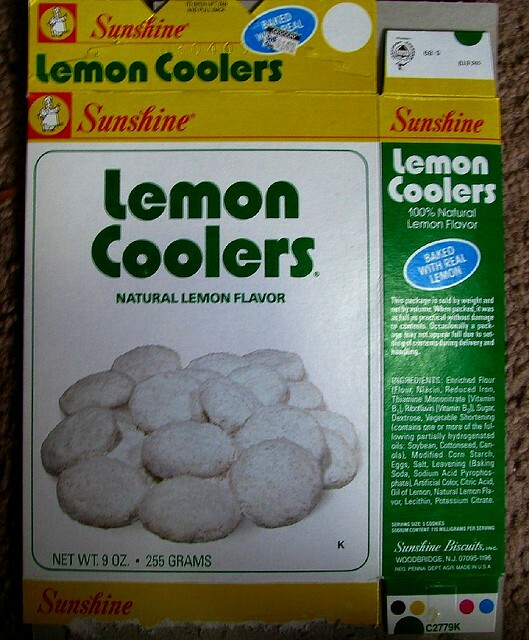 It was distributed by Hollywood Brands, Inc. Another variation was almonds, coconut and nougat. Did the Big Pay morph into the Payday candy bar? Both bars were manufactured by the Hollywood Brands and do look similar. PayDay bars are bars of salted peanuts rolled in caramel surrounding a nougat-like center. So essentially a Big Pay bar just without the chocolate. While you can still buy PayDay bars (now owned by Hershey’s), you are not able to purchase Big Pay bars and most information about them has disappeared. The bird whose nest gets stolen is the swiftlets, who nest on precipitous cliff faces, making the nests very dangerous to obtain. This doesn’t deter anyone at all though. Swiftlets make nests out of their own saliva which hardens like glue when it’s exposed to the air. Chinese chefs soften the nests simply by dissolving them in water. Afterwards the nests have a gelatinous texture. Why? Bird’s nest soup is a delicacy in China who believe the soup promotes good health, especially for the skin. They are prized in China too. (Remember how they are dangerous to obtain?) The soup may be “nutritious” but it is a rare delicacy. The nests are among the most expensive animal products that humans consume and can cost up to $3000 U.S. dollars per pound (depending on grading). Grading looks at the type of swiftlet as well as the shape of the nest and color. Usually nests are white but a red version exists, known as a “blood” nest. 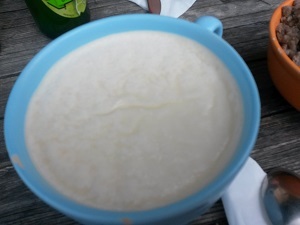 At the foot of the Alps, on the Velika Planina, farmers leave milk out for a very precise amount of time so it can curdle into a yogurt crossed with sour cream like “treat.” It is then topped with sugar or zganci (buckwheat crumble and pork cracklings). Only the right amount of fermenting, souring and rotting preserves the food to increase the taste. Sheep’s head is a traditional delicacy in many parts around the world. There are various smoked versions and a soup that always presents the head whole and intact as the eyelids and tongue are particular delicacies. Sometimes the head even contains the brain (which is actually risky to consume).